Many of us here at The Hoop Doctors are diehard fans of “The Answer” Allen Iverson. In my mind he is pound-for-pound, one of the best players in NBA history, and is quite possibly the best player 6’0 and under this league has ever seen(with all due respect to Nate “Tiny” Archibald). In this generation, their has never been a player who wore their heart on their sleave, whether good or bad, like Iverson. Once he finally decides to hang it up, Allen will undoubtedly be a 1st ballot Hall of Famer as the Sixers will surely make sure that no other player ever wears his signature #3 jersey again. Now that he has just retired un-retired and gone back to Philadelphia where it all started, what better time to honor the original A.I., Allen Iverson with his very own multi-part Player Rewind Series, featuring some hidden gems caught on video showcasing “The Answer’s” biggest and best moments in his HS, NCAA, and NBA career. 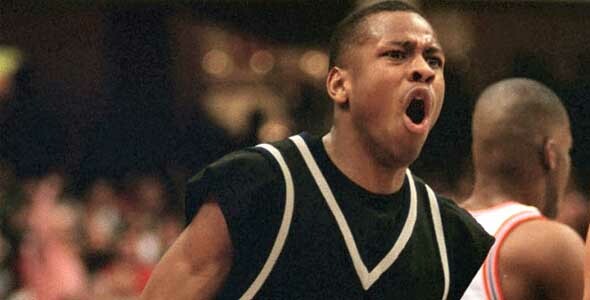 After his senior season at Mt Bethel HS in Virginia, Allen Iverson received a full scholarship to Georgetown University. While the school was known as a Big East powerhouse with some of the best big men in NCAA and NBA history playing for Coach John Thompson like Patrick Ewing, Dikembe Mutombo, and Alonzo Mourning, the school couldn’t pass up bringing a player as talented as “Bubbachuck” to Washington D.C. Iverson chose to play for Thompson rather than the University since Thompson had become a mentor and father figure to the young Iverson. On the court, Iverson was one of the fastest players in the NCAA. In his freshman season(’95), he exploded in Big East play by averaging 20.4 ppg and 4.5 assists as well as leading the conference in steals. He was named Big East Rookie of the Year and Defensive Player of the Year, as he led his Hoyas to a 22-10 record as they advanced to the NCAA Sweet 16. His sophomore season was even better, as Iverson, with his trademark blue cut-off t-shirt exposed under his grey Hoya jersey took his game to the highest level as one of the nation’s top scorers(25 ppg), assist men(4.7 ast), and again led the conference in steals. He received even more accolades after leading his squad to a 29-8 regular season mark and to the Elite 8 of the NCAA Tourney. He was named as a 1st Team All American and was again the Big East Defensive Player of the Year. It was in the Tournament where Allen became a national star by averaging nearly 28 ppg in his 2 seasons at Georgetown.